Born in Murrumbeena, the youngest of three sons to Merric and Doris Boyd, David Boyd is a member of the renowned Boyd family, who are celebrated for their legacy to Australia's cultural development. The young Boyd studied painting and pottery - the two areas of art for which his is best known - as well as the piano, from his family. At the age of 17, he attended the Melba Conservatorium of Music in Melbourne for further piano. However, in 1942, once he turned 18, Boyd was conscripted into the Australian army and was forced to give up his studies. After his discharge from the army in 1944, Boyd received an ex-serviceman's grant to study piano at the Melbourne University Conservatorium of Music. Boyd, however, found study difficult, struggling with the formal methods of learning, and possibly still suffering from the distressing effect of war. Although Boyd loved music and spent hours at the piano improvising, he felt that he was not cut out to be a professional performer or composer. He decided to take up painting and transferred his ex-serviceman's scholarship to the Melbourne National Gallery art school, where studied from 1945 to 1946. During this period, Boyd painted his Soul series as well as some plein air landscapes for his first two exhibitions with his friend John Yule at the Rowden White Library, University of Melbourne. Unfortunately none of his efforts succeeded in impressing critics. While his teachers at the National Gallery School found him talented, he was highly individual and difficult to teach. Altogether these difficulties and failures caused David Boyd to feel that he had made a bad start at painting and should give it up. David Boyd's father, Merric, was a pioneer of Australian pottery, and it was on this skill, learned in early childhood from his father, that Boyd then decided to concentrate. Although these early works demonstrate his father's influence, Boyd quickly developed an individual style alongside his wife, fellow artist Hermia Lloyd-Jones. The partnership was fruitful, with the pair quickly finding critical acclaim both in Australian and internationally from the mid-1940s until the beginning of the 60s. Eventually, pottery led Boyd back to his original artistic exploits, when a series of ceramic tiles that dealt with biblical themes and explorers, convinced him to re-try his hand at painting. A series of paintings based on the Australian explorers from his tiles were the theme of his first solo exhibition in 1957. Boyd's paintings have primarily been produced in series, each of which takes a concept or a theme that, with his fertile imagination, he explores extensively. As a dedicated figurative artist, Boyd draws his themes from the world around him, especially selecting those that arise from oppression and injustice. 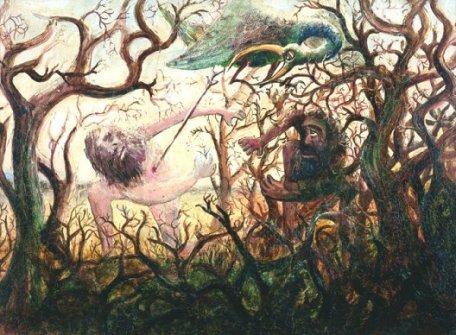 Boyd has often been referred to as a moral painter, although his intention is not to teach, but rather to illuminate the murky areas of the human psyche. In 1959, together with brother Arthur, David Boyd was a signatory to the Antipodean Manifesto and participated in the subsequent exhibition. This was a landmark exhibition and a statement by the participating artists against the move to abstractionism. Boyd explored a number of themes that evolved as quite significant works, including the powerful Trial series, the Tasmanian Aborigines, the Wanderer and Exiles series. Picturing innocence and evil, destruction and creation, his works convey mythical and universal themes. The Trial series was continued while he lived in Rome in 1962 before settling in London, and were the theme of his first one-man shows in London and Paris in 1963. In 1960 David Boyd was elected President of the Contemporary Art Society (Victorian branch) and Councillor of the Museum of Modern Art of Australia. This recognition was followed by his winning first prize in the Italian Art Scholarship for Australia and becoming chairman of the Federal Council of the Contemporary Art Society of Australia, both in 1961. After living in Italy, England, France and Spain during most of the 60s and the early 70s, Boyd finally returned to Australia permanently in 1975.
' The Trial series (expressed ideas about fundamental and disturbing features of the human condition); Tasmanian Aborigines series (referred to the extinction of pureblood Tasmanian Aborigines in the nineteenth century); Wanderer series (was inspired by the life of Benjamin Boyd, an Australian adventurer of the 1840s). ''The Australian Painters: 1946-66'', Mertz Collection, The Corcoran Gallery of Art, Washington D.C.